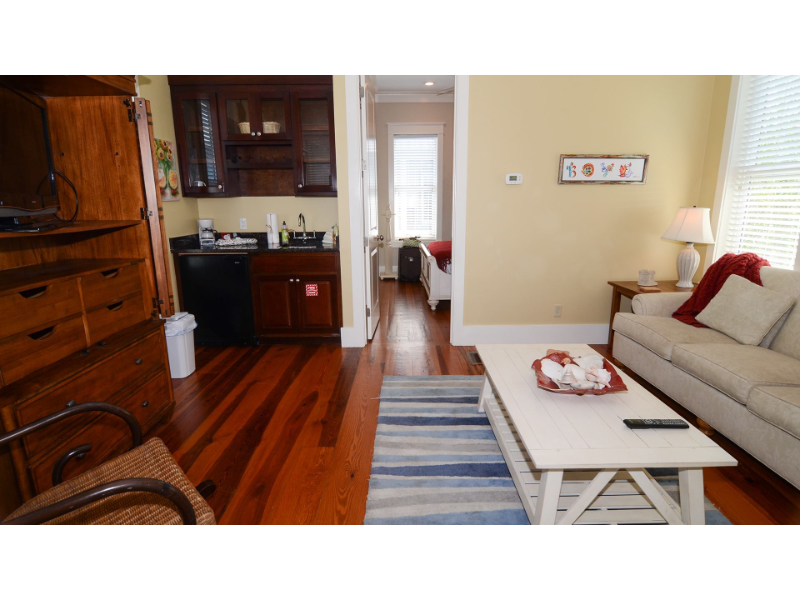 Tucked behind palm trees off the quiet street of Cast Net Ln in Seacrest Beach, this cozy 1 bedroom, 1 bath carriage house is a perfect romantic hideaway or vacation spot for two. A short jaunt will get you to everything the area has to offer: the beach, 12,000 square foot resort pool of Seacrest Beach. local shopping and dining options at Inlet, Rosemary, Seacrest and Alys Beaches. Come bask in this tropical oasis! The carriage house is cozy, with light filtering through the trees and covered deck onto wood floors and sand colored walls. The living area features a full size sofa, rocker and flat screen tv. Here you will also find a kitchenette with a bar size fridge, microwave, toaster and 4-cup coffee maker. Accents like custom artwork can be found throughout the space. The bedroom can be closed off from the living area for additional privacy and is furnished with a plush queen bed. An en-suite bathroom with a large vanity and walk-in shower is located just off of the bedroom area. Guests have full access to everything within the carriage house which is situated over a detached garage (garage parking is not available). This property shares a common staircase with the detached main house. Carriage house guests do not have access to the main house and vice versa.